I have a SharePoint Server 2016 Enterprise Edition farm with SQL Server 2016 Standard edition as the DB server. I successfully installed the SQL Server 2016 Reporting Service Add-in for SharePoint 2016 and also successfully provisioned SSRS Service Application and added SSRS content types to document library. But I am not able to resolve the below error while I try to create a Report Data Source or a SSRS Report. Has any one resolve this type of error before? Please share your experience. After searching a bit on web, I found the Service Pack 1 for Reporting Services Add-in for SharePoint 2016. I had already installed Reporting Services Add-in on SharePoint WFE but SP1 was missing. I installed it on my SharePoint WFE and finally the above error disappeared. 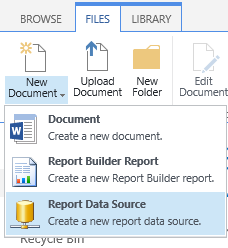 Created a new site collection and added the SSRS content types to a document library and thereafter was able to successfully create Report Source and launch Report builder. Not the answer you're looking for? Browse other questions tagged sharepoint-enterprise 2016 reporting-services report-builder or ask your own question.